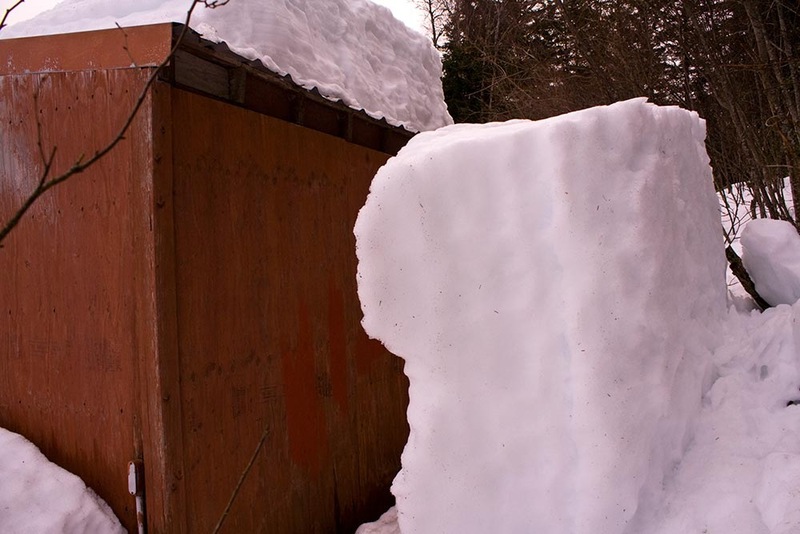 The huge section of heavy old snow pictured below finally slid off the roof of our shed sometime in the middle of the night recently. 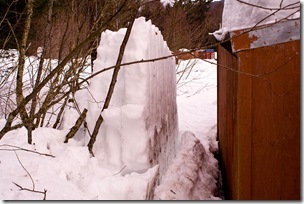 Luckily, it remained jammed vertically in the snow below and did not fall against the shed. What do think it weighs? Click on the photos for a better look…it’s the same berg from opposite ends. 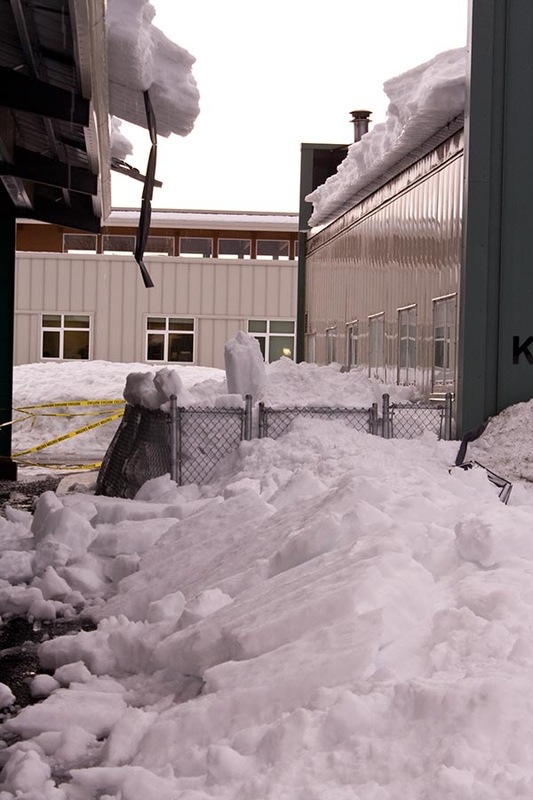 The pieces of mangled metal hanging from the roof on the left were snow stoppers, put on this fairly new covered playground structure to prevent potentially deadly roof avalanches. They were not strong enough, and here is the result. Notice the bulging chain link fence around the small fenced area full of dense old snow. I wonder how much weight is in there. Of course snow density varies tremendously. Even the density of new fallen snow varies quite a bit, but after the snow is on the ground it is subject to the weight of the newer snow compressing it, and to settling with changing temperatures, and to soaking when rain falls on it, a common occurrence in Southeast Alaska. Through some of my own measurements and more from others, I’ve compiled some approximate snow densities in the table below. Since snow is frozen water and air, I think the best way to relate the density of snow is by giving the percentage of water in the snow, i.e., comparing the density of snow to that of water. (This is the same as the specific gravity, which is expressed as a decimal, vs the percentage format as I suggest.) For example, if snow has a density of 20% of that of water, it means the snow is 20% water and 80% air. (We can ignore the mass of the air). This method does not depend on what measuring system you use. If you want specifics from that starting point you can choose your units and do the simple arithmetic. For most purposes metric units are super easy, but for such things as snow load on a roof, we’re used to English units, at least here in the US. 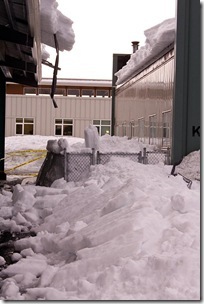 Elsewhere, building codes might use kilopascals (KPa) to specify snow load criteria. I’ve also included the commonly used ratio of snow to water. In fact the table shows more ways to quantify snow density that you probably wanted, but I hope can be instructional as well as useful. The density of water is shown on the bottom row for comparison. Click for a larger version. First the old 10:1 rule–10 inches of snow equals 1 inch of water—is not even a good average for new snow. Perhaps it was developed in a really wet location, or the round numbers were appealing. Instead, I’d suggest thinking of snow at 10% density as uncommon. 7% is a much better average density for new fallen snow. That’s a 14:1 ratio, considerably less than the old rule of thumb. And another rule of thumb to put out to pasture is the one that says the colder it is, the less dense the snow. My research shows that if the temperature is even just below freezing and there is no rain involved, new snow does not stray too far from the 7% average I stated above. As the temperature goes down, the density goes down a bit, but then at very cold temperatures it actually goes back up because the smaller crystal structure can pack more densely. This generality is for snow falling without too much wind. With strong winds, the density also goes up some because crystals are broken into smaller pieces and the wind can arrange them yet more densely when they come to rest (wind slab). There are so many factors that go into snow density and so many observational issues that can throw it off that one should not assume too much precision or accuracy in reports and calculations of snowfall or snow density. Remember, we are dealing with ice and air. The air part is what makes the density change, but the air part is of no consequence! In reality, the liquid part is all we need to know. There is little difference in shoveling or plowing 1 foot of snow at 10% density or 2 feet at 5%. The liquid part is called the snow water equivalent or SWE. You can get the SWE for new snow from the weather report (the precipitation) or from your own rain gauge. The table above is intended to estimate the SWE of the snow on the ground or on your roof or boat or whatever, among other things. Another surprise, for me anyway, is that even after umpteen melt-freeze cycles and tons of rain, old snow seldom reaches densities greater than 50%. 30-40% is more common. Say you are wondering if your roof can handle the snow load. The most accurate way to figure the pressure would be to take a core sample–a vertical slice of known cross sectional area—and weigh it, then convert the weight to a unit area, say one square foot or 1 square meter. But there is another way that does not necessarily involve going up onto the roof. Measure or estimate the depth of the snow, then multiply by the figure in one of the pressure columns that matches the type of snow you are dealing with. For instance if you’ve got 24 inches snow on your roof that fell in the last week and the temperature has been consistently well below freezing, the density is probably only 10% to at the most 20%, so choosing 20 to be conservative, that’s only 1 lb per inch of depth, or 24 lbs per square foot, worst case. But say you’ve got 24 inches of snow that fell over the last month and the temperature has swung above and below freezing many times and there’s been some rain on it too, the density is probably 25-30% which could make the snow load around 38 lb/ft^2. So, what was the weight of the big chunk of snow? I did directly measure the snow load on the shed roof pictured above (carefully from the perimeter) a few days before it slid off. After two different measurements showed 61 and 71 lbs/ft^2 (the latter was in a deeper section) I shoveled the most critical part of the roof for fear of collapse. Since I was expecting warm weather and rain, I shoveled a channel across the rood to encourage separate sections to slide. After it did fall off, I roughly measured the surface area (the two formerly horizontal dimensions) of the block and multiplied by the snow load I had come up with from my core samples, adjusted a bit for the varying thickness. The result…the big guy weighs between 5,000 and 6,000 pounds (2,300 and 2,700 kg). The density of that rain soaked old snow was 30% overall with the densest layer at 42%.